Slide damage to Reservoir 4 in Washington Park, circa 1898. City of Portland (OR) Archives, Reservoir 4 damage, A2008-009, 1898. With only shovels and a horse team, so much work to do, wow! How awful it was. The ancient Washington Park Landslide pushes back. 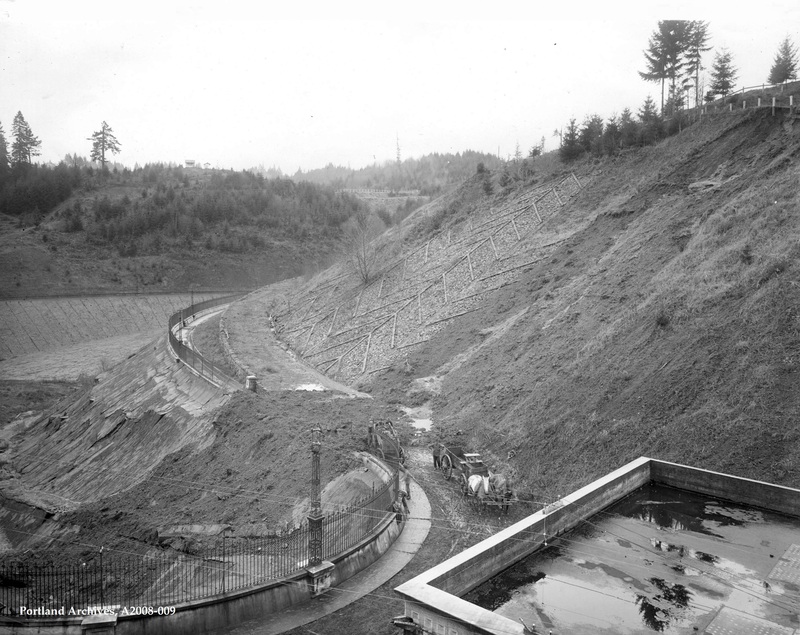 Even during early construction, they realized they had built Reservoir 4 into an active landslide. This ancient landslide begins uphill at the Japanese Gardens and slides about 15 inches/year. Because R4 was built into an active landslide, it’s necessitated constant patching and replacement of the west wall of the reservoir over the years. In 2015, the city had enough and began plans to disconnect it from the public drinking water system and transform it into a lowland habitat bioswale. Not a popular decision in the eyes of the Friends of Reservoirs, a group that protects these landmarks. That arrow pattern on the bank seems to have prevented sliding in that particular area. Anyone know anything about that as a means of protecting the slope? If not for the landslides, Washington Park would have been a housing development. There are tons of jobs out there for ten bucks an hour. From what I recall from geology classes I’ve taken, slides occur when the soil on the slope exceeds its saturation point and the whole soggy mess slides down on a layer of clay which are found at deeper layers in the hillside. Those boards placed on the surface of the slope, in a christmas tree pattern are a futile attempt to at prevention; since they probably didn’t understand the nature of slides back then. This reminds me of a well I was directed to dig when I was an US Army Engineer Crane Operator in Vietnam during 1966. I was 20 years old, fresh out of Crane School training in Ft Leonard Missouri, and had never dug any wells before. The Major in charge knew less than I did. He was very good at pointing a stick at where he wanted the well to be dug. I soil was 600 years of sand stacked up, so as the hole got deeper, it got wider. When it was about 50 feet across and only about 8 feet deep with no water in sight, the project was halted while the Major and his advisers talked about 10 minutes and decided to call in some bulldozers to fill the hole back up. As I recall one of the dozer sunk a bit and needed to be winched out by two other dozers. I was never asked to dig another well.